In the forest, in the pond, in caves, prairies, and jungles, in all the world’s outdoor “classrooms,” baby animals are...learning! They are taking lessons on how to be an expert swimmer, alarm-sounder, racer-chaser, or hide-and-seeker. They don’t have books, or desks, or computers. But they do have teachers! Just like human children, animal babies from chicks to bear cubs learn lessons from adults around them. 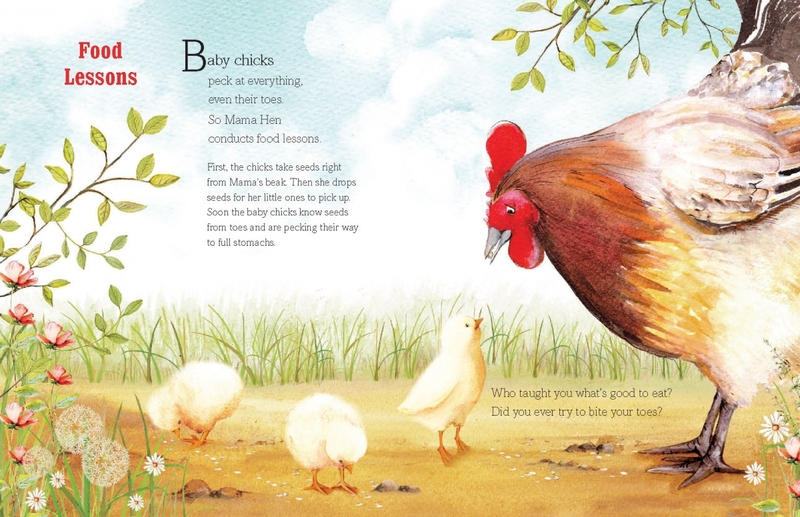 Spread by spread, the conversational text of this instructive title presents skills a dozen different young animals have to learn and connects them to readers. Two paragraphs describe the learning task: finding what’s good to eat; learning to swim, defend, feed and shelter oneself; learning to recognize and make particular sounds. Questions to readers follow. “Who sings to you?” the narrator asks after presenting information on penguins. Some shared skills may surprise. It takes time for elephants to learn to use their trunks for drinking, just as it does for children to learn to drink from a water fountain. Great apes learn tool use: Chimps crack nuts with stones, and orangutans gather leafy branches for umbrellas. 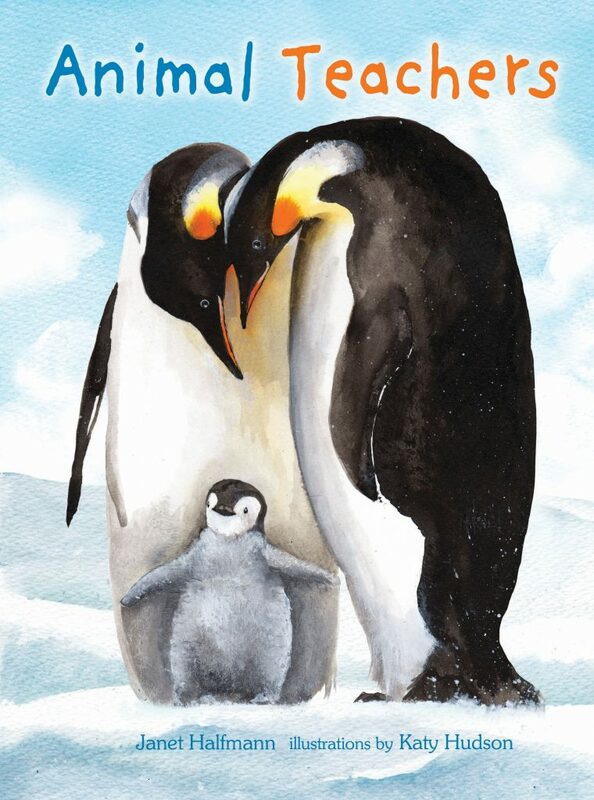 Hudson’s realistic pen-and-watercolor illustrations show animal parents and their child or children in their natural environments. (The leafy endpapers are less relevant, showing an unlikely collection of unmentioned though recognizable birds and a few animals, some placed so far toward the edges they will likely be hidden by the cover flaps.) A final spread offers two to four additional interesting facts about each of the creatures described. Nicely connecting the child to the natural world, this would be a useful opener for a unit about animals as well as a title to share with young animal lovers. Janet Halfmann learned a lesson or two from animal "teachers" who strutted, clucked, and grazed on her family's crop and dairy farm. She and her husband, Tom, live in South Milwaukee, Wisconsin.